This error message indicates that there is some kind of verification, and the local nodename could not be retrieved. 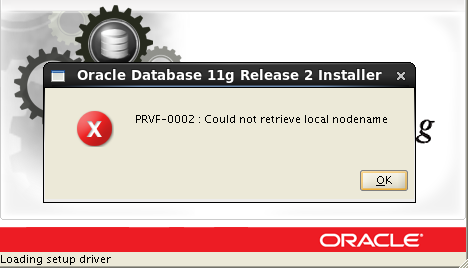 The problem is that Oracle installer is trying to do a reverse lookup on our hostname and see if the hostname that we’re using is actually accessible from the network. It tries to ping its own hostname but since we didn’t setup the DNS yet, it cannot do that (cannot resolve the name). In order to solve that, we need to do one of two things: we can either add a DNS record to out DNS server, or we can add a local record in our /etc/hosts file. After adding the hostname, we can run the runInstaller and it will work smoothly.